All Thanks and Praise is to God, we seek His Help and Forgiveness. We seek refuge in God from the evil within ourselves and the consequences of our evil deeds. Whoever God guides will never be led astray, and whoever God leads astray will never find guidance. I bear witness that there is no god but one God (Allah), that He has no partner or son, and I bear witness that Muhammad is His servant and His final messenger. I bear witness that Jesus Christ is His servant and His messenger. This book The True Message of Jesus Christ is a brief summary in which I wish to clarify the origin of Christianity and its present day reality. It is to lead the Christians to know the roots of their beliefs (to believe in one God and unifying Him in worship). 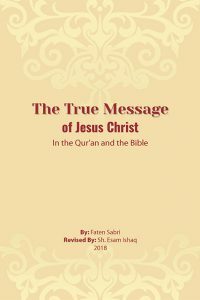 In this summary, I have made an effort to cite the Qur’anic verses which mention the story of Jesus Christ and his mother, and to give the evidence from the current texts of the Torah and the Gospel to illustrate to the Christian readers The True Message of Jesus Christ using their own sources. This book helps all freethinkers, open-minded and the seekers of the truth to know that what was sent by God to all nations with all messengers throughout the history was one unique message (Pure Monotheism). Prophet Jesus was also one of those pious messengers who endeavored to guide their people to the truth, but many people followed their desires and thus went far from the prophetic teachings.